First Line: "And we ask your abundant blessing, Lord, on these, the outcast dead..."
Forensic archaeologist Dr. Ruth Galloway likes the Service for the Outcast Dead-- prayers said for plague victims, paupers, and prostitutes who were buried in mass graves-- but this time she has another reason for attending the service at Norwich Castle. She's almost positive that she's uncovered the remains of the infamous child murderer known as Mother Hook. Her boss is thrilled, and before she can blink she finds herself in front of the cameras for a television series called "Women Who Kill." It's not all bad, since she gets to work with the handsome and intriguing American historian, Dr. Frank Barker. In the meantime, Detective Chief Inspector Harry Nelson is working the type of case he dreads. A woman's third-- and last-- child has died, and Harry believes she's killed all three of her children. Before he can find definitive proof, children begin to go missing, and notes are left behind by someone self-styled "The Childminder." It's just the sort of case that strikes terror into the hearts of every parent. This series is one of my favorites, and The Outcast Dead is the best so far. Griffiths continues her theme of parenthood with two storylines. Mother Hook is an infamous Victorian child murderer who is alleged to have killed at least twenty children in her care and sold their bodies to the resurrection men (grave robbers who sold corpses to medical schools). Against everything, Ruth believes the woman to be innocent, and the reader gets to follow along as she finds information and pieces things together. The second storyline with a mother accused of killing her three children as well as the child abductor is DCI Harry Nelson's bailiwick, and suspense builds as his team tries to find the truth before any more children disappear. As good as the storylines are, I have to say that Griffiths' cast of characters is superb. Ruth is intelligent and strong, but she's also a single mother who's been living in a sort of limbo. Her house is out in the marshes-- neither land nor sea. She's neither married nor single, really, since she has a very young daughter. She's written a book, but it's yet to be published. It was good to see that there may be changes afoot for one of my favorite characters. Although Ruth is the star of the series, this is very much an ensemble cast. The father of Ruth's daughter, DCI Harry Nelson, is very much married, and we get to see how these people deal with their mistakes because they certainly haven't been swept under the rug. As Nelson works his cases, readers get to know the team of police officers who work with him, and their lives begin to figure more strongly into each book. This small group of characters have formed a very modern sort of family-- dysfunctional at times, but capable of working together with energy, intelligence, and compassion. In the mood for a little history, two good mysteries, and a cast of characters so real that they feel like family members? 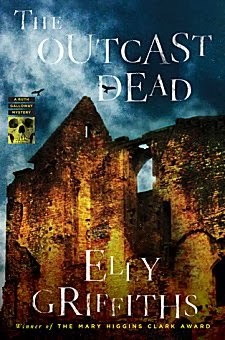 I highly recommend Elly Griffiths' Dr. Ruth Galloway series. I can't get enough! I love this series. I have been eagerly waiting for the release of this new book. I am glad to see it is one of your best reads for 2014. I've loved this series since the very first book, and I'm sure you have, too! Cathy - I couldn't be happier about your enthusiastic recommendation of this one. I really do love this series, and it's good to know that this one maintains its quality. If anything, it not only maintains it, but improves upon it! I like the cover you show here, different from the UK version but very atmospheric. I think we do share a favorite character. :-) Usually I have a tendency to prefer the UK cover on books, but this time I do like the atmospheric quality of the US cover. Yippee! I love the character of Ruth Galloway and this series. So glad to see that you think it's the best book so far, so I have this one to look forward to reading. It's interesting how the Harry/Ruth relationship teeters and totters, but when Harry has to be pro-active to protect their daughter, he does it. Yes. Although I love Ruth's very-human character, as complex as most of us, I enjoy the ensemble, too. Always happy to "sing to the choir," especially when it's about books I love, Kathy. Try to read Visitation Street by Ivy Pochoda. It's largely character development, about human relations, solidarity, but with a mystery edge. Now I'm reading Mari Strachan's Over a Dead Man's Embers, anti-war set in 1921 Wales, very good main character of Rhiannon Davis, observer of life around her. Thanks for your recommendations, Kathy. They're always appreciated. Well, talk about recommendations. Here I've been up all night reading The Outcast Dead. I rushed to get it based on the rave review here -- and here I am in the early morning hours hesitant to put the book down. Yes. It's good. I don't know if it's the plot itself that is good or the inner dialogues of Ruth and Nelson, their reflections and then their dialogues with each other. I don't want to do anything else but read this book -- the true signs of a bookaholic, but what else is new? Elly Griffiths doesn't disappoint, but her books get better. I wish I knew Ruth, lived on the marsh, heard seagulls in the morning, had a little house,a garden, a cat, and knew more about archaelogy. But what are these books for? I can do this all vicariously without moving from my Manhattan home. Isn't one of those houses vacant where Ruth lives? I wouldn't mind being her neighbor, that's for sure! I'm very glad you enjoyed this book so much!